This guide is applicable to both online and offline play. Some of the points raised here are automatically taken care of online by the software, but if you’re playing live in a casino or in a home game then you will feel much more comfortable if you know and act according to proper poker etiquette. This is probably the most fundamental poker etiquette rule to follow and if you don’t follow this then you will certainly find out the nasty side of your opponents and you may well get in trouble with the card room you are playing at. Acting in Turn means that you shouldn’t act or make any indication of how you are going to act until it is your turn. Even if you are going to fold it is not fair to the other players to let them know you are going to fold, and if you are going to raise, don’t start counting out chips until it is your turn. Acting out of turn will put either you or your opponents at a disadvantage by letting others know how you are going to act before they have to act. Mistakes happen from time to time but if you consistently act out of turn then it will not be tolerated. There is nothing more annoying that having to wait for one particular person to act every single time it’s his or her turn. You shouldn’t be rushed in your decision making process, and it is fine to take the time to think when you have a genuine decision to think over. However be reasonable and think of your opponents and act as quick as possible when it is your turn. Also pay attention and ensure you are aware when it is your turn and not having to rely on opponents to remind you it’s your turn every time. Do not discuss the hand until the hand is over and your comments cannot influence the people involved in the hand. Perhaps the worst instance of this is when somebody folds their hand and the flop comes down A 7 7 and someone blurts out “can’t believe I folded I would have had Quads”. By making comments during the hand you may be giving information to the players who are acting and make it unfair on them. So whether you are involved in the hand or not, if you have any comments to make then make them after the hand has finished. Concentrate on playing your own hand and do not help other players at the table regardless of how new they are to the game. It’s fine to give them advice on how to act such as the minimum bet they must make, but under no circumstances should you advise them on what play to make. Don’t throw your chips into the pot, this is not only rude but it also makes it hard for your opponents and the dealer to see how much you’ve bet. Make your bets clear to your opponents and the dealer by stacking your bet out neatly in front of you and clearly separated from any other chips on the table. When you want to make a Bet or Raise then it is bad etiquette and sometimes can go against tournament rules to “string” bet. What this means is you place a number of chips out into the center of the table and then you reach back into your stack to add more chips to the bet you have already laid out on the table. 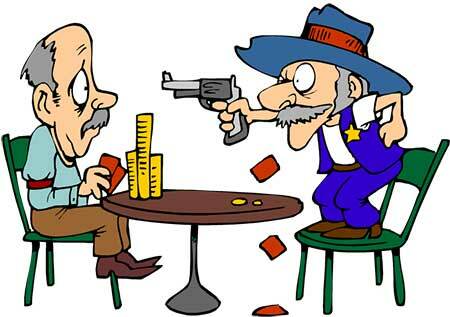 In some establishments your only legal bet is the first action you make, so your opponent may ask that you remove the second bet you add in. The best way to avoid this is to clearly announce to the table that you are “Raising” and then state the amount of your bet before you put your chips into the pot. Once you place chips towards the center of the table they are committed to the pot and you cannot remove them again. Some tables even have a line that runs around the table and this is the commit line, where once you have pushed chips past this line, they are committed. So you cannot grab a big stack of chips and start to move them into the middle in order to try and get a read on your opponent’s reaction to this. This is not only bad etiquette but it is also against the rules. Do not give chips to opponents in order to increase their stack, even if its not blatant it is not fair on the other players at the table and will get you thrown out of the game quicker than you can move all in with a royal flush! You may have heard the term “chip dumping”. This is where one player intentionally plays a big pot with a weak hand in order to “dump” their chips to another player to increase their stack. If you do this in a casino you will more than likely be escorted off the premises (if you’re lucky!) and if you do this online then you will fall foul of the anti-collusion protection built into most online software programs and your account may well be closed and any funds in there frozen. The final thing is to be nice and polite to your opponents. No one likes the idiot in the corner who is rude to the dealer or other players. Avoid criticizing other people’s play and be modest in victory and courteous in defeat.